Welcome to Hooah Honey an online store where military wives and such can shop online for cool tee’s, hoodies, gifts and more to show their support for their soldier. 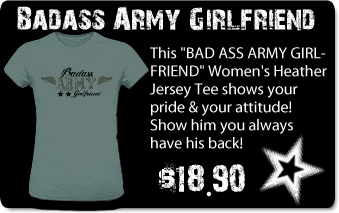 If you have a cool idea for Army Wife Tee, just send us an e-mail. We can also customize anything you want for no additional charge!